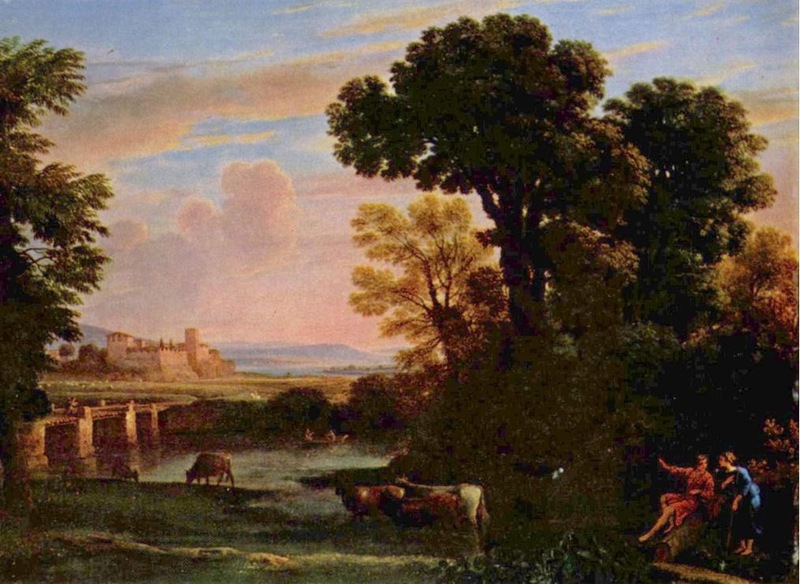 The landscape work of Claude Lorrain was enormously influential from the mid-17th Century on. But we find an interesting formal contrast in “View of La Crescenza,” the piece I always go to see when I’m at the Met in New York. This is painted on quite a different scheme. The trees form a screen across the foreground, rather than a mass to one side. The foreground obliques, while lively, take the eye no farther than the shadowy treeline in the middle distance. Directly above is the castle, which is square in the middle, at the extreme rear of the pictorial space. 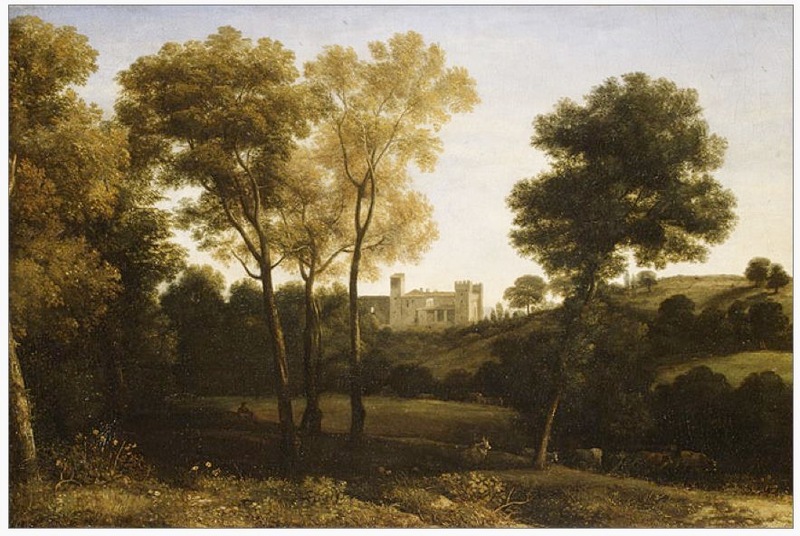 Judging from the light coming in from the right, the castle has a view—probably something grand and spacious like the Pastoral Landscape–but we don’t share it. Nor is there a cycle that takes us around the composition. When we get to the castle, we stop: that’s it. The softness of the castle allows the more contrasty foreground to reassert itself, but back and forth is all the action: nothing travels on. The effect is to make this the remembrance of a particular place–it’s a real castle, near Rome–rather than a romantic ideal. This is why I like it. It’s a very knowing and artful piece of work, but it’s a direct response to something Claude saw, without so much sweat on it. Of course, while Claude used the oblique progression device to great effect, he wasn’t the first to employ it. 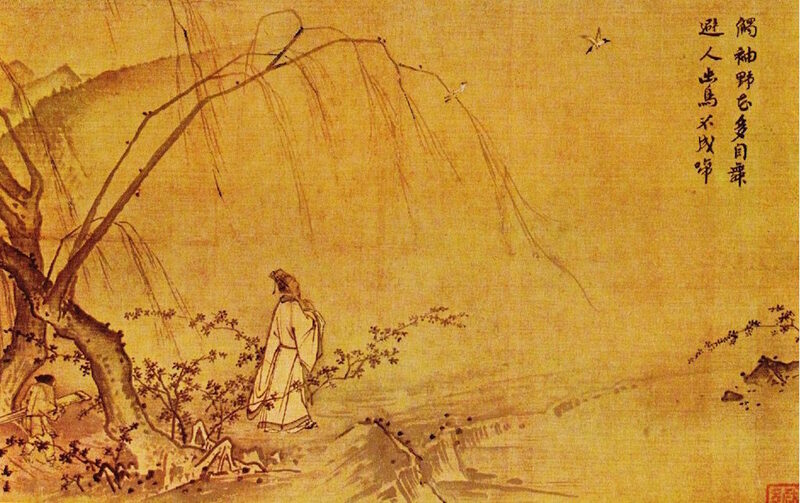 Ma Yuan worked in 13th Century China. He doesn’t go see-sawing into the distance, as Claude does. From the foreground the landscape dissolves immediately into contemplative space. But the strong inscription on the right operates like Claude’s secondary mass of trees, if more abstractly, to keep the eye from drifting away. As you focus on the inscription, the softer image to the left reasserts itself, while the bird and the delicate fall of branches guide us back to the foreground.